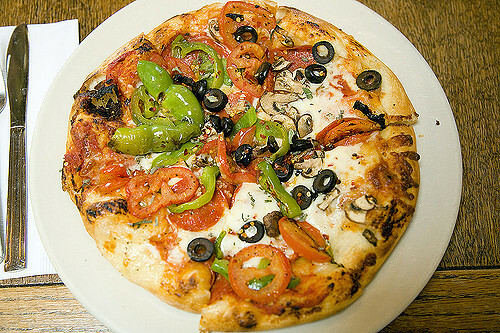 Pizza is a dish that originated in Naples, Italy between the 16th and 19th century. It was brought to the United states by Italian immigrants. World war II veterans that were coming back from war provided ready market as they were introduced to the dish back in Italy. Since then, the consumption of pizza has increased. It’s now one of the most popular fast foods all over the world. As a result, pizzerias like Pizza Hut, Papa John’s and Dominos. Pizzerias refers chain restaurants that specialize in pizza. Today, pizza is either sold freshly baked or frozen in stores. The two types main sub-types of pizzas hand tossed pizza and pan. The words hand tossed and pan are terms that you’ll come across as you make your pizza order. They’re used to help make thin and thick crust pizza. As you know, the crust refers to the lower part of a pizza. These two pizza types follow different processes in their making. To prepare pizza using this method, you’re required to toss the pizza dough through the air as the name indicates. First, you should knead the dough until its tender. Then, toss it in the air to aerate it such that the finished crust is soft. Continue tossing until the right thickness is acquired. Although the dough is supposed to be soft, it shouldn’t be too slender. The dough however needs to be thick enough to hold the toppings added. Note, tossing the dough mastery of the technique. After tossing, a thin layer of sauce is added on top of the dough and it’s left to rest for 2-3 hours. Since, the dough is soft, it can easily be placed on a pan. Toppings are added once the dough has risen. Ideally, the dough should be baked for 10 minutes at a temperature of around 500º F. The end result is a crisp-like pizza that’s more flat than pan pizza. Pizza was first prepared Pizzeria Uno in Chicago in the 1940s. Hence, the Chicago style pizza or deep-dish pizza. Unlike the hand tossed pizza, the pan preparation doesn’t require tossing the dough in the air. For this method, you roll the dough into balls and spread them directly into the pan to get the shape. Then partially bake it before adding cheese and other topping like meat. After the toppings are added, you return it to the oven for finished baking. Usually, pizza prepared by pan is baked for 15 minutes. But, at a higher temperature than in the hand tossing method. Also, pan pizza is thicker and harder than hard tossed pizza since it has no space to expand. Consequently, it is eaten using a fork. To make the crust crisp-like, you can coat the pan with oil. In hand tossed, the dough is continuously tossed through the air to aerate it and acquire the right thickness. On the contrary, in the pan method the dough is placed directly into the pan without tossing. The pan method results in a thick and fluffy pizza while in hand tossed it results in a thin and crisp-like pizza. For hand tossed, the dough is slender due to the continuous tossing in the air. On the other hand, the dough for pan is thicker and is rolled into balls before placing into the pan. Mostly, the temperature for high tossed is around 500ºF while it should be higher than that in pan pizza. Pizza cooked by pan method is eaten using forks while hand tossed you can eat hard tossed pizza with your hands. Without the use of forks. Pan pizza was first cooked in Chicago hence; it was invented there. Hand tossed pizza on the other hand can trace it roots back to Italy. Due to its thickness, pan pizza can hold more topping than hand tossed pizza. Basically, pizza is prepared using two methods: hand tossed and pan. Both hand tossed and pan pizza use a standard dough comprising of flour, yeast and salt. Toppings are added to both hand tossed and pan pizza. These topping include: meat, vegetables, seasonings, spice, cheese and mozzarella. However, these toppings may vary according to country or region. Note, toppings may be sliced thin to ensure that they heat through. Or you’ll the toppings may not cook. And, toppings with big chunks such as sausage or peppers may be precooked before being placed on the pizza. As we’ve seen they’re both hand tossed and pan pizzas have different crust. So, thick and thin crust is mostly a matter of preference. However, you may want to choose hand-tossed over pan. This becomes the pan is returned to the oven after adding toppings. Hence, it is cooked twice. Plus, pan pizza will require more oils for the fan pizza to make it crispy. But, remember the hard tossed pizza will need you to toss the dough. And, to toss you’ll require to be familiar with the tossing techniques. Evah Kungu. "Differences Between Hand Tossed and Pan." DifferenceBetween.net. 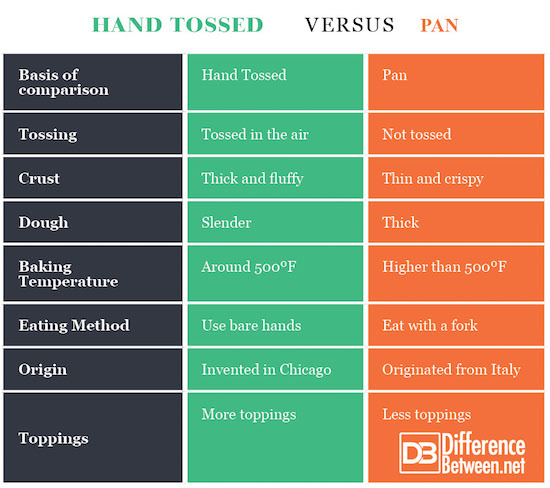 July 23, 2018 < http://www.differencebetween.net/object/comparisons-of-food-items/differences-between-hand-tossed-and-pan/ >. Delpha, J.; Oringer, K. (2015). 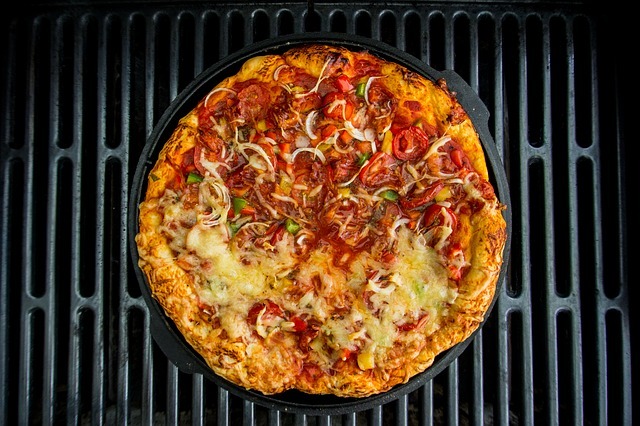 Grilled Pizza the Right Way: The Best Technique for Cooking Incredible Tasting Pizza & Flatbread on Your Barbecue Perfectly Chewy & Crispy Every Time. Page Street Publishing.